When it comes to movies, I’m still a huge fan of all the deluxe theaters in the Triangle! 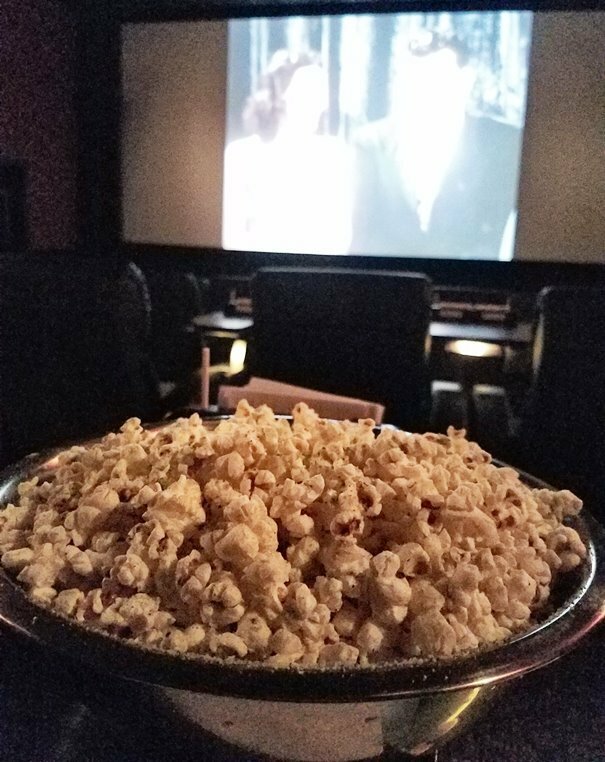 While I love cranking up my HD screen at home with surround sound, there’s nothing like catching a new movie in a cozy recliner with food and beer close at hand. So I was excited to hear about the new Alamo Drafthouse coming to Raleigh but I admit I was curious as to how it would compete with places like IMAX, Raleigh Grande, Cinebistro and Silverspot. But after a couple of visits to the Alamo Drafthouse, I can tell you that it certainly holds its own in the super-cinema competition! One of the reasons I do like Alamo Drafthouse is because it’s given downtown Raleigh another movie option besides IMAX. While IMAX is awesome, it’s limitation to one huge screen, first come, first served seating and minimal concessions make it a more basic experience. 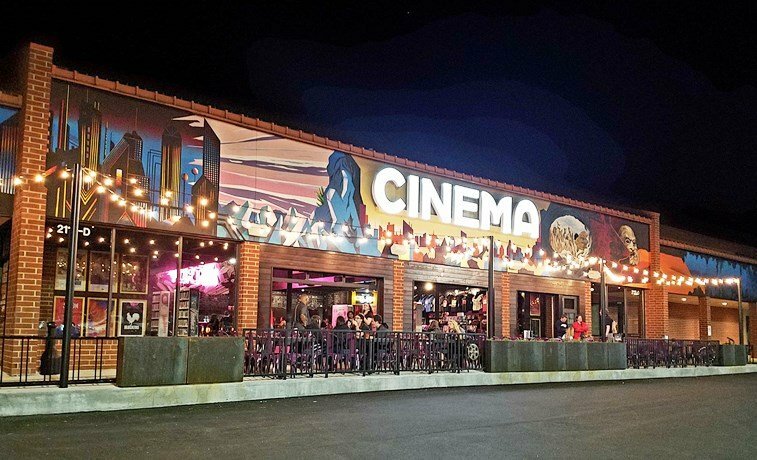 This new Alamo Drafthouse is located just minutes away from downtown Raleigh off of New Bern Avenue in the eastern party of the Oak City which is growing rapidly. And while the shopping plaza it sits in is a bit run-down, the Alamo Drafthouse itself is top-notch in terms of construction and design. With an outdoor patio up front and slick neon lounge inside, Alamo Drafthouse nearly gives you the feeling it’s a bar rather than a movie theater. You’ll also find the Video Vortex, a one-of-a-kind video shop where you can rent VHS tapes for free. The Video Vortex is meant for movie buffs given the titles they stock (kitschy, independent movies) and the VHS format. Note that you can also rent VHS recorders here since you may have thrown that old beastie out, years ago! 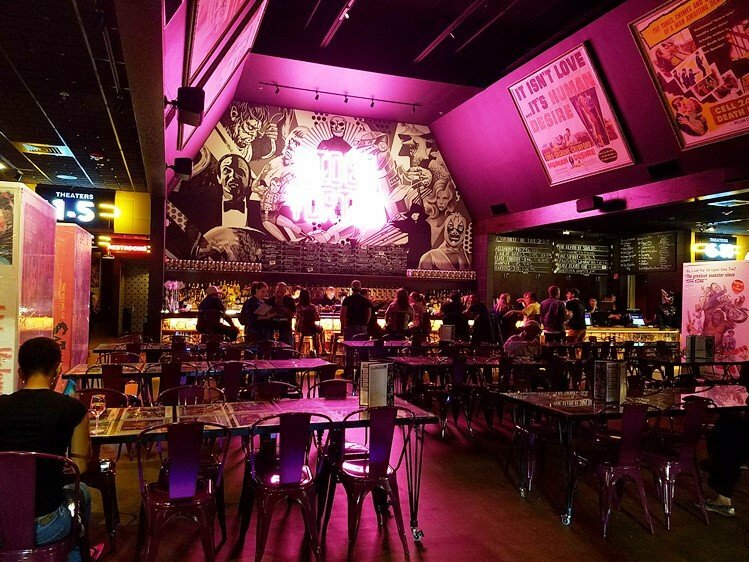 The bar at Video Vortex stocks over 40 decent brews which is at the core of what the Alamo Drafthouse is all about! Now one thing you’ll immediately notice at Alamo Drafthouse is NO ticket booth or ticket takers! You buy your tickets online ($8 to $12 for 2-D flicks) and carry it into the theater on your smartphone app. At the theater, there will be waitstaff inside to check you in. Sorta odd experience for me but actually pretty cool. This set-up also allows the Video Vortex to run as a separate bar, open to non-movie goers! 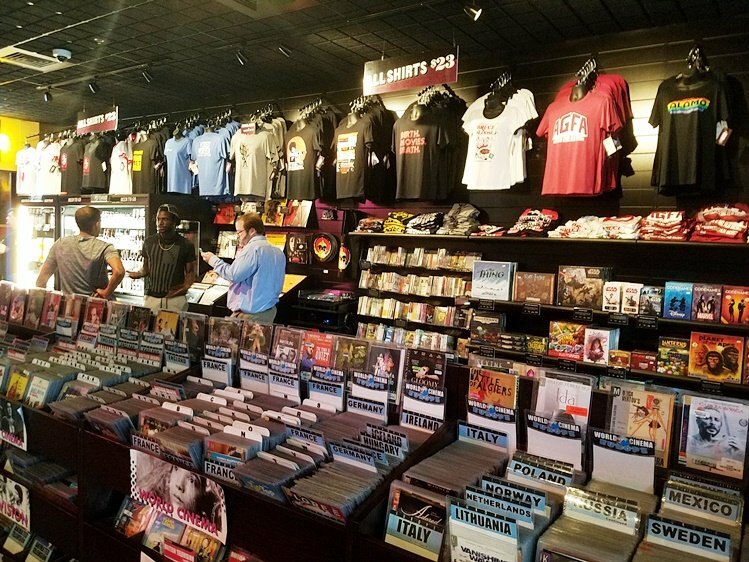 With 10 screens, Alamo Drafthouse Raleigh offers up a nice selection of current movies and mixes in some classics from time to time. 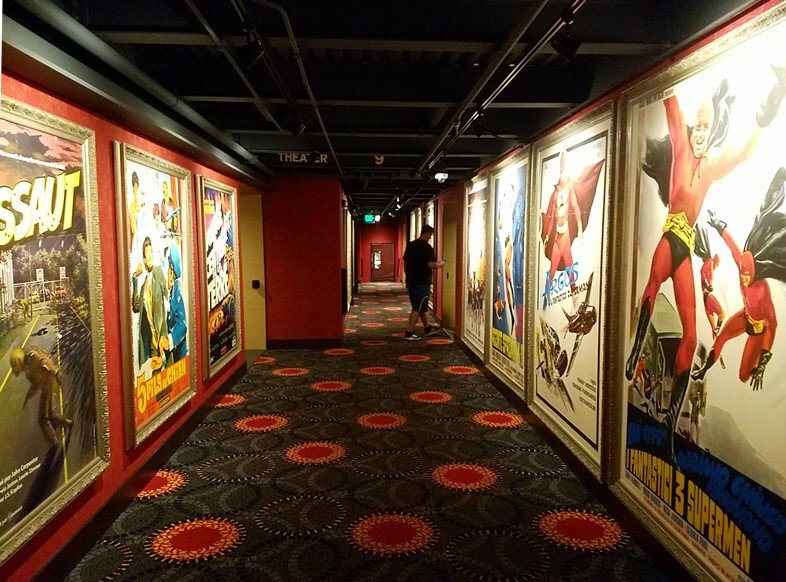 The hallways are very bright and colorful with kitschy movie posters and prints lining the walls. 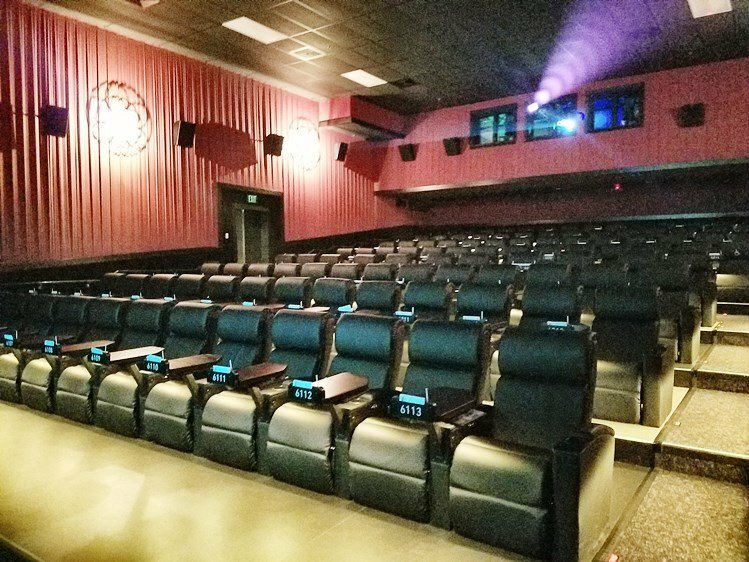 The theaters themselves are comfortable and modern with leather chaise seating with motorized leg rests and decent rise between rows. The seats are pretty comfortable and each one has a fixed side-table with light underneath. I noticed that while the seats are motorized, they don’t tilt quite as far back as other theaters so you don’t end up in full-on snooze mode! Food is served in the theater (30 minutes before your movie starts) and also during the movie itself. 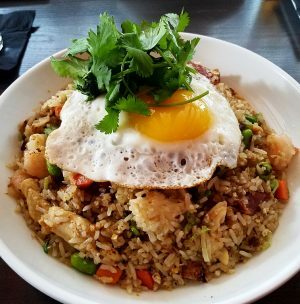 Alamo Drafthouse offers up a nice selection of fancier appetizers, burgers, pizzas and sandwiches. I’d put their food menu as better than Raleigh Grande and similar to Frank’s Cinebowl in the mid-tier in terms of quality and choices. All the items are in the $6 to $15 range which is pretty affordable. Hand your server your credit card and they’ll come back with the receipt about 15 or 20 minutes before your movie ends. The screens are pretty nicely done with good sound-systems but the movie-watching experience won’t quite blow you away like IMAX. 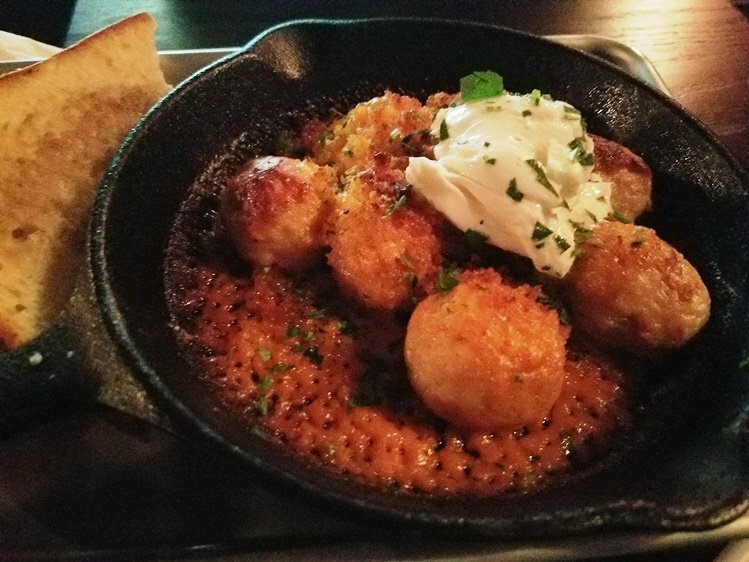 I tried out a very tasty chicken meatball in cast iron skillet served with some garlic bread. 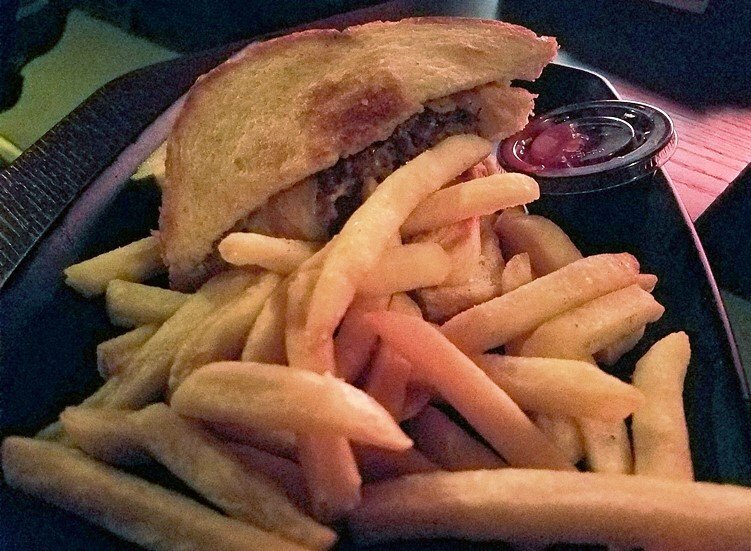 And the patty melt at Alamo Drafthouse was quite good, too. Served on thick Texas toast and layered with caramelized onions, it makes for a tasty meal. The food at Alamo Drafthouse falls into the category of basic sports bar/pub eats but they do have a handful of regional specials revolving around Southwestern Hatch chiles (mac n cheese, chips n queso, loaded fries).